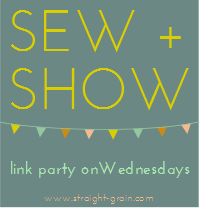 today i’m supes excited to be joining the Boardwalk Delight blog party celebrating the summeriest fabric line designed by the summeriest gal, reigning queen of the sewing blogs, Dana Willard of Made Everyday! Dana’s tutorials were pretty much my first introduction to the kid sewing blog scene about 7 years ago, and i’ll always hold a special place in my heart for her and what she’s done for the community. 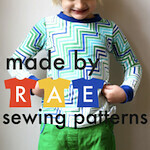 her tutorials (and recipes) are fantastic, her patterns are awesome, and now…she’s a designer of adorable fabric too! go Dana! 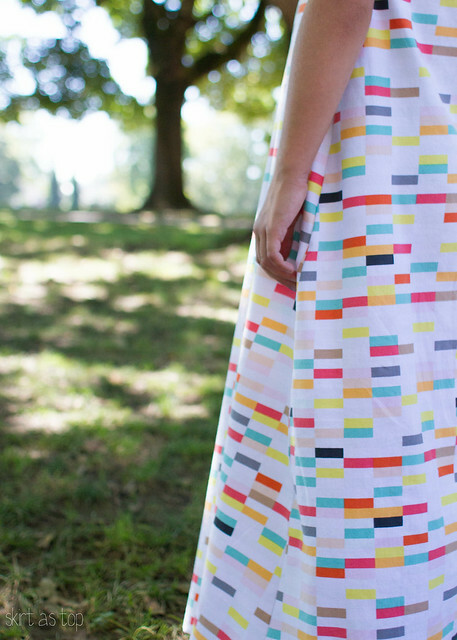 Dana’s new line is called Boardwalk Delight, and it’s happy summer times in fabric form. she paired up with Art Gallery Fabrics, and when she invited me to the tour, i immediately knew i’d pick a knit if it existed, because Art Gallery knit is my favorite. 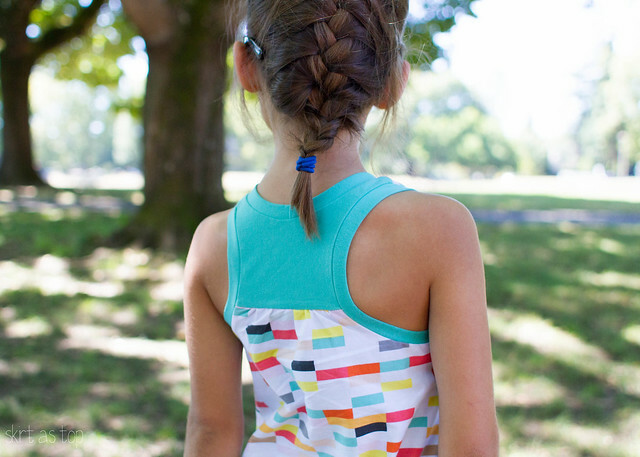 it’s so soft and easy to sew, and stays vibrant through many washings. it’s perfect clothing weight. i love it. i chose the ice cream shop print in knit. now, apparently the bars were intended to be vertically oriented, not horizontally (thanks Cherie!). however, after a minor freakout where i worried i’d messed up Dana’s vision, i realized the pattern told me to orient the greatest stretch across the body, and the fabric stretched more with the stripes going horizontally, so that’s why i oriented it that way! not a late night cutting error like i originally thought. haha. 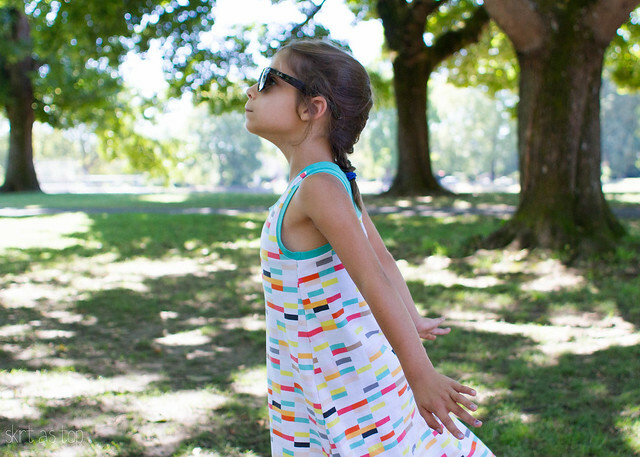 the pattern is Hey June’s FREE Racerback Dress, which Adrianna recently improved and graded for sizes 1-8, so go download it and sew one up before summer is over! this is a size 5 (for my mini 8 year old) plus about 18 or 19” added in length. i did it the lazy way and just extended out the side seams at the same trajectory as the pattern, retaining the slight curve at the bottom. i love how it shows off her buff gymnastics shoulders. 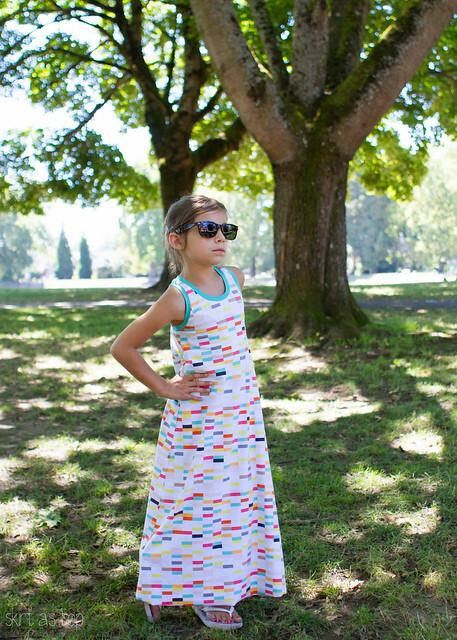 it was E’s idea to make it a maxi dress, which was genius. 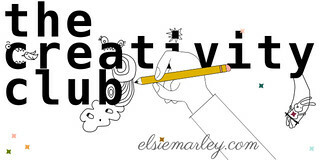 i love doing something a little special for blog tours, and that was just the ticket! she was absolutely thrilled with this dress. her first reaction was a gasp and “it’s beautiful! it’s so soft!” and she’s worn it two days in a row, so i’d say we have a winner here. 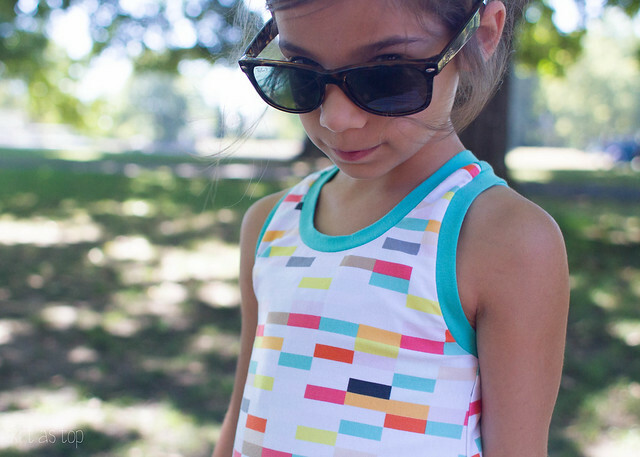 look for the entire Boardwalk Delight line wherever fine fabrics are sold – there are adorable prints in knit, cotton, and canvas to fit your summer sewing needs. 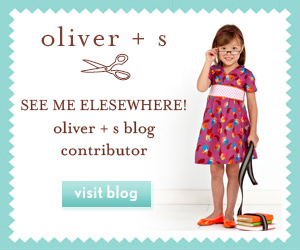 thanks so much for inviting me to the blog party, Dana! don’t miss Cherie’s skirt and shorts, Anna’s poolside tote, or Rae’s birthday dress! the cutest, you guys. Oh that dress is perfection! And the model is too adorable. Love how she’s rocking it. i think that’s my favorite print in the line – such a cute dress!! So much fun for a fun girl (with a fun Mom). 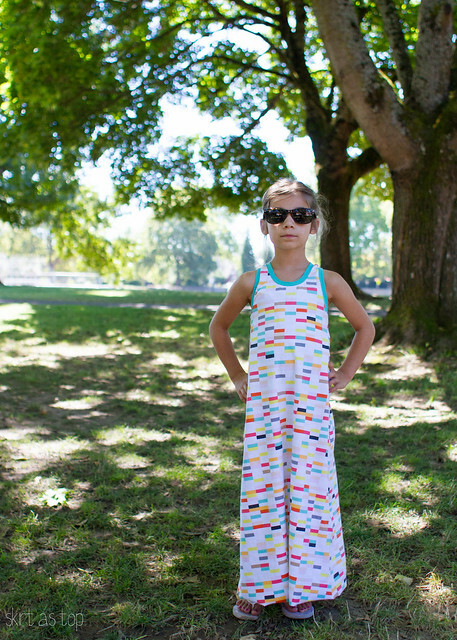 I like the horizontal bars, the summery colors and the pattern you chose to show off the fabric and the gymnast. So cute! E’s rockin that dress! Her serious face is killing me! 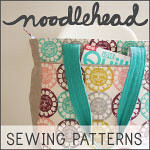 I think I need to check out this pattern, too! Love it! 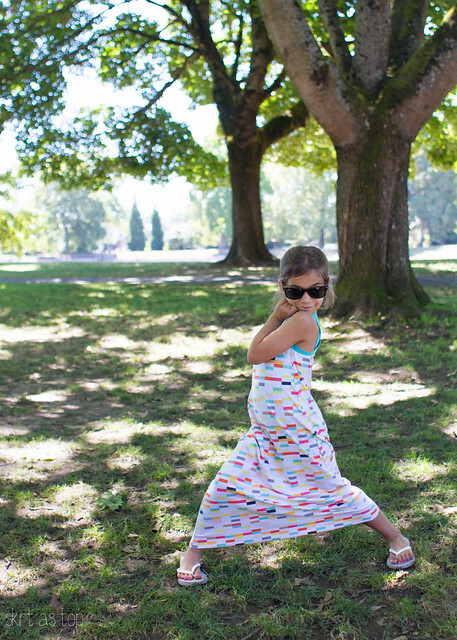 Such a great idea to make it into a maxi dress. Aww this is so cute!!! Perfect for summer! 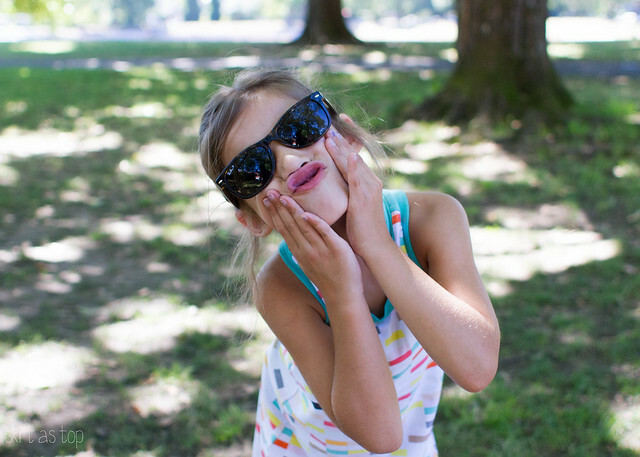 Oh my gosh Kristin, this is so crazy cute. And the turquoise worked so perfect with the dress. haha. The dialogue between you and Cherie about the direction of the bars. 🙂 I think either way is fine! Seriously, thank you for participating and for the kind words. You are fantabulous!